I feel this struggle with food pulling me… toward some epiphany about You, your power, your plan. But, honestly, this whole experience hurts and I’m tired. I just want to give up and try a bunch of short cuts to just lose weight. I just want to be skinny, fit into my clothes, and never worry about food or fight with food or lust for food. So I come to You. Oh God- Refresh me. Renew me. Give me a fresh and new purpose and passion to care for this body you’ve given me. Help me remember that it is an honor to You when I honor my body. And please God, give me wisdom. Whisper in my ear what to do, which way to go. Guide me to information that will help me overcome. Light it up in my heart so that I might become determined and disciplined once more. I know that You always have great, amazing and sometimes shocking plans and I know that I often don’t see the entirety of your plan. Help me to walk in faith and know that even through this struggle you are working a miracle of faith in my heart, that you are laying a path for a future prosperity in my soul, that you are doing something purposeful. God, I love you. I trust you. I believe you. Give me patience to wait on You and Your plan. And it’s not that I’m the type of person that wants things super fast. I mean, hey, my favorite way to cook is in the SLOW cooker. My favorite days are long summer days that seem endless. See? So one would think that I’d be totally down with my life being, essentially, a slow cooker meal… it’s just gonna take a while to be ready. Here’s the difference between my life and a slow cooker. In my life, God is the cook… and only He knows how long I need to sit in that slow cooker. You see, oftentimes, I think that I’m “done” too soon and I’m ready to get out. But what do we all know will happen if you take something out of the slow cooker too soon? It’s GROSS. It’s not right. It’s… not. done. So you either have to put it right back in the slow cooker for a while longer and wait, or you have to toss that thing in the microwave (in which case, it’s never as good and it’s often burned in places or very, very dry). Uh huh. Ya seeing my little comparison there? Sometimes when we think we are “done” with struggle… we find ourselves shocked that it comes at us again. But oftentimes, we are simply not “done”. God knows that our hearts are still a sloppy mess of raw tendons and sinews, of blood and bacteria. On the outside you might not be able to see it, but on the inside He knows the condition of our “done-ness”. Or, if we are insistent on staying out of the slower cooker (and often, we are resistant to God’s “holy recipe” for our life), then He ends up having to toss us in the microwave where the struggle is MUCH more difficult, MUCH more trying, and MUCH more life-sucking (in lieu of far fancier words that I could use there). And although we get “cooked” all the way through that way too, there is often just less of a fulfillment in our life, just as the food is never just as good when cooked super fast. We get burned. And our inner cores aren’t really exactly the same: we often have to have extra water or moisture (cue the spiritual ketchup or mayo) to compensate for our speedy-bake. The easy part about me really cooking in a slow cooker is that I can plan my life around it: I know EXACTLY when dinner will be ready. The hard part of God being in charge of my slow cooked life is that I have no clue WHEN I’ll be done. But just like my children have to wait for the awesomeness of a slow cooked meal… smelling the aroma for hours, salivating every time a waft rushes by… so do I have the pleasure of waiting, and trusting in the slow work of God. Because as I look around as His creation, I know that He is an amazing “cook”. And I know that whenever He takes me out of that “slow cooker” situation… Not a moment too soon. Not a moment too late. It means that I’m ready. done. prepared. Perfectly prepared to be an enjoyment to my God. In July, my husband quit his “real job” (hehe) to work out of our house on his own company and invention (shout out: ChordDice.com) and so we are in MAJOR budgeting mode. Have I already talked about this? I feel like I have already talked about this. 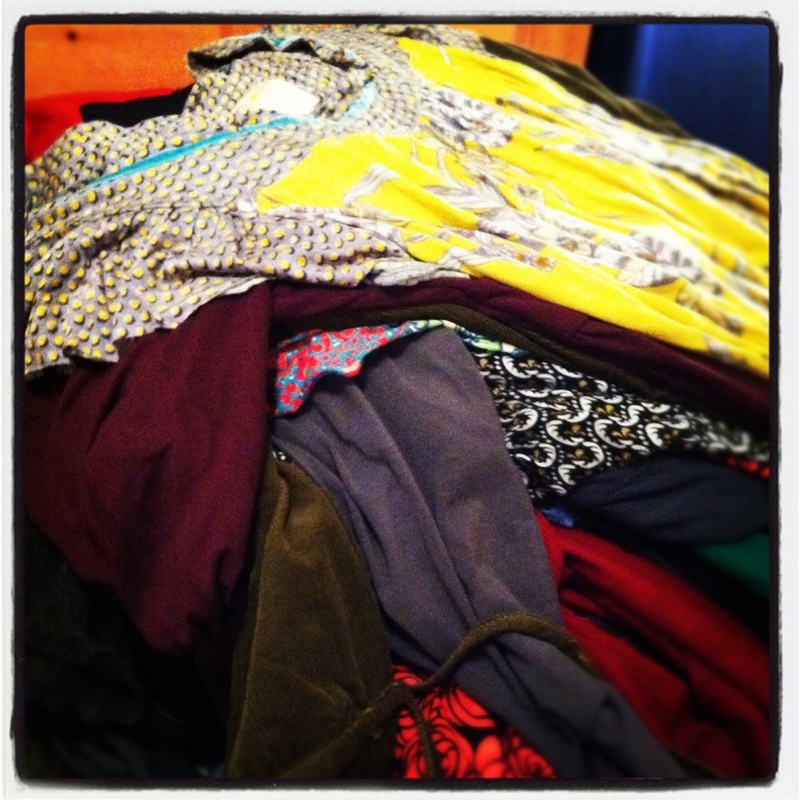 Oh… yes, I did… and it actually has the same topic today as I did on Day 221: CLOTHES! Cause, in essence, I don’t have many clothes that I can wear out of the house that fit me anymore. (Yes, a blessed blessing!) But I just decided to not worry about it. Aside from asking for a pair of boots for my birthday, and spending about $15 of my birthday money on some super sale shirts at Target… I have just been wearing the same outfits over and over again. I was getting a little intrigued though as to how I was going to do that come winter when I had, like, one or two long sleeve shirts to wear out of the house. In the house I knew that I could rely upon t-shirts and sweatshirts (love that uniform anyway), but when I go to church I was going to have to rotate through about four outfits. And He provided in a way that I wasn’t expecting. I always thought that provision for clothes had to be in the form of money to go buy some. And He did WAY better than that! And then, the same week, a friend of mine that owns a clothing store just… GAVE me several ADORABLE dresses, some jewelry, and a few shirts of their leftover inventory. I would LOVE to give them some props but I’m not sure if that is something that I’d be allowed to share. I’ll have to check first! But I mean… uh.dor.able. stuff. Update: I just got “permission” to let y’all know about the store that donated to the “January Got Skinny And Poor” Clothes Closet (hehe, I think I’m so clever!). 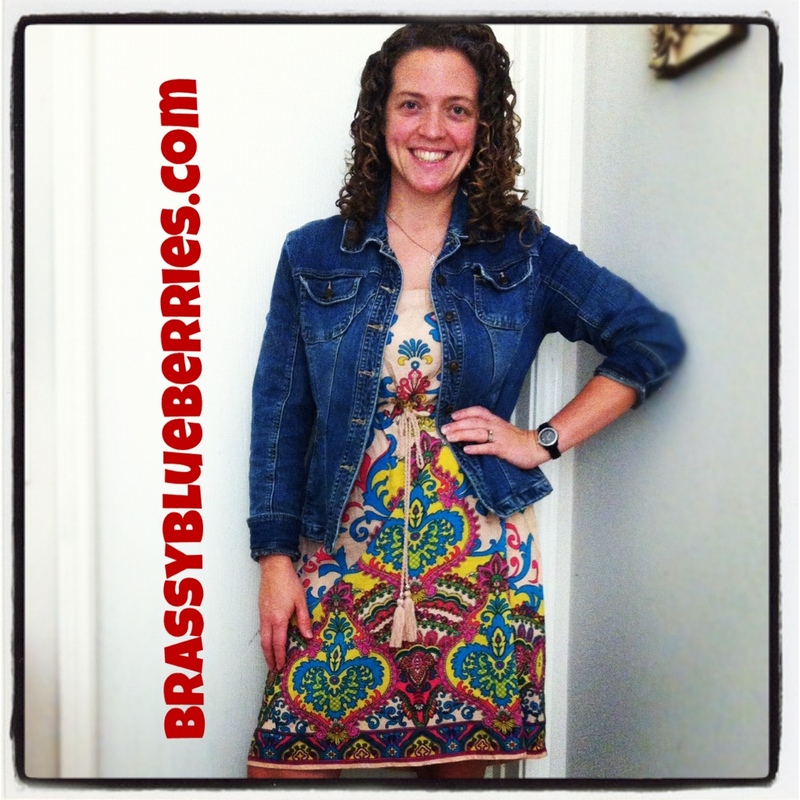 They are called the Brassy Blueberries and their website is www.BrassyBlueberries.com! Their stuff is SO. CUTE. and they are obviously SO. NICE. If you live in Texas they have a booth at Canton! And I was just overwhelmed with CUTENESS and I was IN FASHION for the first time in, like, well… ever. And I was clothed. And warm. And blessed by the giving spirit of these two ladies. Well, then Friend-Who-Doesn’t-Wear-Gap-Afterall-But-Way-Cuter-Stuff texts me yesterday and says that she went through her closet again, and she brings me FOUR BAGS of beautiful clothes… dresses, tops, workout shorts, sweaters, t-shirts, etc. etc. etc. I spent almost AN HOUR playing dress up last night just wading in the clothes. It was like flipping Christmas. I kept going in and showing my husband and telling him that he’d have to take me on a date in this outfit, or that I looked really cute in that outfit. And, of course, today was bible study so I wore one of the suuuuuuuper cute shirts! And He did… He gave me GOBS more clothes than I could ever afford had He provided me with money to go buy clothes. He totally gave me everything I needed… and more. But I also have to say that those two women… whether they were just being kind or whatever… they were used of God in my life. They were the feet of God… coming to me and clothing me. Oh God, may those two women receive abundant blessing for their generosity. May you look at them in Heaven and say “Thank you… thank you for taking care of my January.” And God, my thanks to you is neverending. May I remember YOU every time I put on a cute top or a fun dress. May I remember the garment of sorrow that YOU wore on the cross for my sins. May I remember the blood stained fabric that was left in the tomb. May I remember YOU and your care for me. I love you God, and thank You for loving me. Amen.